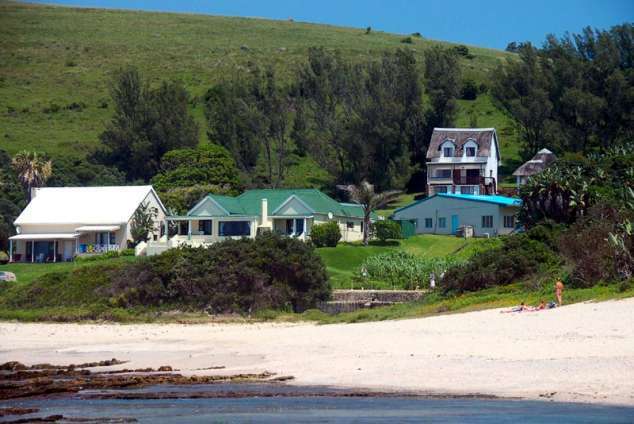 Rob Roy Sea Cottage - Haga Haga Accommodation. Remember those holidays long ago, when kids played in the street till dark? When neighbours visited? When families had time to have conversations? Where moms shelled, dads fished and kids swam all day? No traffic, no malls? Remember? You can relive these carefree, beach, family holidays at "Rob Roy" Cottage, in the tranquil seaside hamlet of Haga-Haga! Here is something for the whole family to enjoy; even your pets are welcome. This original Beach House is only 30m from the waves, nestled in a secluded cove. This rambling home sleeps 10 people (5 bedrooms), comfortably, and has one full bathroom (bath, shower, basin, wc), as well as a separate shower (with basin & wc). For your convenience an experienced domestic will service the cottage daily, at an additional cost. All bed linen is provided, but bring your own bath & beach towels. The swimming beaches are safe and the rock pools abound with life. Fishing is good in this area; remember to purchase your fishing license at St. Anthony's Store, en route. Winters are awesome with generally mild daytime temperatures and wonderful whale watching. There is a fireplace which creates a lovely ambiance on cold days and you can have fire, watch TV and enjoy panoramic sea views at the same time. If you can tear yourself away from the glorious sea views, there are good recreational facilities. These include a 9-hole golf course, with clubhouse and "Pub & Grub"; tennis courts, horse-riding, nature walks, game viewing, an otter trail and a sensational whale-watching point. The Haga-Haga Hotel is a favourite watering hole, and provides a lively diversion for the young and the young-at-heart. "Rob Roy" cottage is available all year round, but be sure to book well in advance. If you need to destress and recharge your batteries, there can be no better destination. 46224 page views since 13 Oct, 2005.